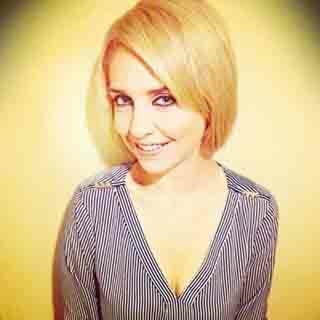 Update: Katie Vinten has been promoted to Co-Head of A&R at Warner/Chappell. During the past few years, Katie Vinten has emerged as one of top, young creative execs in the music publishing business. Based in Los Angeles, she is Vice President of A&R at Warner-Chappell Music. Vinten works with a talented roster of songwriters who are delivering hits on the pop charts for Warner-Chappell. She is involved with talent acquisition, and she also pitches songs and sets up writing collaborations on behalf of the songwriters she represents. Originally from North Carolina, Vinten moved to Los Angeles to pursue a career in the music business, after graduating from New York University (NYU) in 2006. She paid her dues by doing temp work at several music companies, before landing a fulltime position at EMI Music Publishing as an A&R administrative assistant. Vinten was able to demonstrate her creative abilities at EMI, which led to her being named Creative Coordinator in 2009, and then promoted to Creative Manager a year later. It was at EMI that Vinten worked closely with top music exec Jon Platt, who recognized early on her potential as a creative exec. When Platt departed EMI to join Warner-Chappell as Head of Creative (he is now President of Warner-Chappell, North America), he subsequently offered Vinten the position of Director of A&R at Warner-Chappell, and she accepted and joined the company in October 2012. At Warner-Chappell, Vinten has been instrumental in the careers of songwriters Justin Tranter (who’s co-written hits for Fall Out Boy, Selena Gomez, Hailee Steinfeld), Julia Michaels (Fifth Harmony, Selena Gomez, Hailee Steinfeld, Zedd, Demi Lovato etc), Captain Cuts (Walk The Moon, Smallpools, Tove Lo, R5), Audra Mae (Kelly Clarkson, Miranda Lambert), Nick Monson (Lady Gaga, Selena Gomez) as well as performing artists/songwriters Greg Holden and Katy Tiz, among others. We are pleased to do this new Q&A interview with Katie Vinten. She tells how she got started in the music business, which songwriters she helped sign to publishing deals, and she talks about her work with Warner-Chappell’s hit writer roster. Vinten: I’m from North Carolina—I was born in Connecticut, but grew up in North Carolina. I always loved music—I took piano lessons and a few guitar lessons, and I sang in the high school choir. I also took vocal lessons in both the operatic and contemporary music fields in college. One day [when I was a teenager] I was in the parking lot of a Blockbuster video store, where my little brother was picking out a movie. I heard the John Mayer song, “No Such Thing.” It was a moment which served as catalyst for changing my life. There were specific lyric lines that really resonated with me, such as “I wanna run through the halls of my high school, I wanna scream at the top of my lungs. I just found out there’s no such thing as a real world. Just a lie you’ve got to rise above.” Hearing these lyrics was a catalyst for change in my life… also some direction. I wasn’t as afraid to bet on myself. DK: Where did you go to college? Vinten: I first went to UNC (University of North Carolina at Chapel Hill) which felt like the 13th grade in so many ways. I then did a brief stint at Emory University (Atlanta). For me, the school wasn’t as creative as I wanted it to be, so I decided to transfer to NYU’s Tisch School of Arts and study Film & TV Production. To get in, I needed to submit a creative piece of work. I wrote a short story about a songwriter who was near the end of his life. When I got to NYU, I was writing scripts and I did some acting there. I loved seeing films, and I was always going to concerts. I started to make music videos. Everyone was obsessed with the big film directors, but I didn’t care about that. I wanted to make videos of songs that I was obsessed with. In my personal time, I was going to a lot of concerts—music was everything to me. I had a part-time job working at the Virgin Megastore at Union Square. 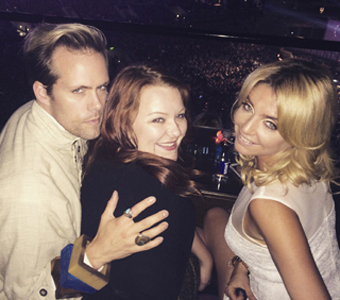 Pictured (l-r): Justin Tranter, Audra Mae and Katie Vinten. After being at NYU for a couple years, I wondered if I could also get a music business major. At NYU, there’s the Steinhardt School Of Education. I applied for their Music Business program, and got in. However, it would have required an additional 2 semesters of courses which wasn’t in the cards. With the confidence of having at least been accepted, I took open music business elective courses, and I started doing internships in the business, from MTV, Verve Records and Sony Records. I started to learn about all different sides of the business. DK: When you graduated from NYU, how did you decide to move to Los Angeles? Vinten: I graduated from NYU in May 2006. I had a hunch that if I didn’t leave New York City then, I would never leave. I was becoming comfortable and I didn’t want to be too comfortable. I knew I needed a change. I packed up and headed to L.A. with no job. I started temping at every music business gig I could get. I worked as an assistant to a music supervisor, and at an entertainment law firm as a legal assistant. I also got a temp job at Universal Music Publishing, which lasted a year. I would fill in for A&R assistants and film & TV assistants. I started to feel a bit stagnate and knew I needed to explore some other real opportunities. I started to apply for permanent gigs after a little “quarter life crisis” of needing to really get focused and take the reigns. During this period there was a great thing which happened. I met my future husband, Aaron. He has been my biggest champion and he helped build my confidence. We got married last December (2014). I wouldn’t be doing what I’m doing now if I hadn’t met him. Things really started to fall into place. DK: Eventually, you landed a permanent (non-temp) job at EMI Music Publishing, How did you get this job? Vinten: I applied for a job that was listed on EntertainmentCareers.net, for an executive assistant position to an A&R exec at EMI. I submitted my resume, and I received a call from EMI. [The rep said] that this position had already been filled, but they did have an opening for an A&R admin assistant position. I went in for the interview, and thought the interview went well. Two months went by and I hadn’t heard anything, but then I got a call from EMI saying they had wanted to hire me, but there had been a hiring freeze. [The EMI rep] asked me if I was still interested in the job, That morning, I was interviewing for a permanent gig at the law firm where I was temping. Needless to say, I decided to take the EMI gig, less money, but there was no ceiling. Turns out it was the right decision. DK: What were your job duties when you started at EMI? Vinten: At first, I assisted two A&R execs. My position was administrative, but I would keep an eye out for great new songwriters and artists. The first songwriter I helped sign was MoZella (who has since written hits for Miley Cyrus, Madonna and others). I was a fan of her’s, and I saw Mozella perform in New York at Irving Plaza. I also saw that she had a new album coming out. I literally reached out to her on MySpace. Little did I know Jon Platt (then President of Creative, North America, at EMI) was familiar with MoZella through one of his writers that had been co-writing with her. So when I brought her up to him he was fully supportive and already on the case. He then negotiated the deal with MoZella. Two months later I got promoted—I became Jon’s executive assistant. Ben Berger, Ryan McMahon, Justin Tranter, Katie Vinten, Priscilla Renea, Ilya Salmanzadeh and Ali Payami. During this time, one of my duties was to help organize our Annual Songwriters’ Conference, which included our songwriters from around the world. At the conference, A&R reps presented their projects, and we set up writing sessions, plus other events like social mixers with the PROs. I learned so much from the experience. I continued to work with MoZella, and I also worked with hit songwriter Julie Frost (Black Eyed Peads, Beyonce, Pitbull), who Jon had signed. My writer roster started to expand, as I continued to do session coordination, song pitching, and set up showcases with our sync team etc. 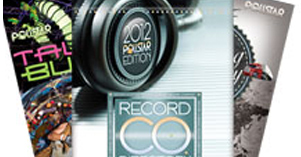 In 2009, I became Creative Coordinator and then I was promoted to Creative Manager in 2010. DK: How did you decide to leave EMI and work at Warner-Chappell? Vinten:[In early 2012] it was announced that Sony/ATV Music was buying EMI, so signings came to what felt like a halt during this transition. No one wanted to sign to a company that was in flux. Jon had decided to leave EMI. I decided to leave shortly after. I soon came to Warner Chappell after I received a call for Jon offering me a position in A&R at his new headquarters. DK: You’ve had some excellent successes since joining Warner-Chappell. How did you get started there? Vinten: When we started, there wasn’t a focused pop roster at Warner-Chappell. There were a lot of bands and we had some flagship artists. My job was to find the next wave of talented new writers for our roster. My focus has been on working with pop songwriters—setting up co-writes for them and pitching songs are a huge part of my day. I work closely with my writers every step of the way. DK: Who are some of the songwriters that you work with? Vinten: I work with songwriters Justin Tranter, Julia Michaels, Nick Monson, Captain Cuts, Felix Snow, and more. DK: Justin Tranter is a hot writer who’s had two recent Top 10 pop hits. How do you work with Justin? Vinten: Justin was the lead singer and main writer for the band Semi Precious Weapons. They were signed to Warner a year or so prior to me starting at Warner Chappell. When I met Justin, the band was in limbo with the future of their label situation and their publishing option was up. Jon (Platt) asked me to meet with Justin to see if he had interest in writing beyond just the band. I met with Justin and asked if he wanted to write for other artist projects and to co-write. He gave a super enthusiastic and resounding “YES!” He definitely wanted to win and work hard from day one. (Soon after) I started plugging him into writing sessions. Justin writes amazing lyrics and has great concepts, that are second to none. His work ethic is unmatched. Artists adore him, because he respects them. He brings an energy and a point of view to a room that you just don’t get with many people. Recently Justin co-wrote the hits “Centuries” for Fall Out Boy and “Good For You” for Selena Gomez. He also co-wrote the debut single, “Love Myself” for Universal Republic artist, Hailee Steinfeld. He also has the new single “Cake By The Ocean” for Joe Jonas’ newly formed band, DNCE, which I’m really excited about. DK: Julia Michaels is also a hot writer and I read that she’s only 21-years-old. Vinten: I signed Julia in December 2014, She’s one of the best songwriters that I’ve ever seen or heard. She’s just 21, but she writes as it she’s lived several lives. She writes like an artist and her melodies are beautiful. She collaborates a lot with Justin Tranter—they bring out the best in each other. It’s really exciting to see. She co-wrote the Selena Gomez hit “Good For You” with Justin and Nick Monson. Nick (Monson) is also an excellent writer/producer. He co-wrote the hit “Applause” for Lady Gaga, and he co-wrote several other songs on her Artpop album. We saw something great in him when signed him in December 2013…beyond the Gaga work. I put him in writing sessions for a year straight when things started to come together. In addition to co-writing Selena’s hit “Good For You,” Nick has worked with Nick Jonas and he has a lot of other cuts in the pipeline. DK: Earlier this year, you were promoted to Vice President of A&R. Are your duties different, or similar to what you’ve been doing? Vinten: My duties are mostly the same. I do find myself starting to mentor some of the younger staff more. I continue to love working with our songwriters and helping to develop them. I’m looking to sign the best in all genres. I want to continue to build a great reputation for Warner-Chappell. I love what I do.